Take-Two Interactive Software, Inc. (TTWO – Free Report)	shares have fallen since the firm reported its strong fiscal third-quarter financial results last week. Despite top and bottom-line beats and impressive sales from its newest video game offering, Electronic Arts (EA – Free Report)	stoked fears that free-to-play power Fortnite is set to harm the paid-gaming industry. Take-Two’s downturn might, however, set up a solid buying opportunity. Take-Two crushed top and bottom-line Wall Street estimates last Wednesday and its highly-anticipated sequel to Red Dead Redemption has sold 23 million units since its October 26 launch—to blow past Electronic Arts’ Battlefield V’s just over 7 million copies. Overall, Red Dead Redemption 2, NBA 2K19, Grand Theft Auto Online, and a few other titles helped Take-Two’s net bookings soar 140% from the year-ago quarter to reach $1.569 billion. Still, shares of TTWO have plummeted roughly 13% since last Tuesday as investors grow worried about the possibility of Fortnite grabbing more mark share. Electronic Arts’ disappointing results, which came out a day before Take-Two, seemed to cause much of the recent industry downturn. Electronic Arts said that it faced “significant challenges” during the quarter and expects them to continue in the current period. EA CEO Andrew Wilson mentioned competition 13 times on his company’s earnings call, but never directly mentioned Fortnite. “This year, battle royale modes became incredibly popular in shooter games,” Wilson said. As we touched on briefly already, shares of TTWO have suffered over the last week as Wall Street assess what’s next for the industry amid increased competition from the free-to-play power. Shares of rival publishers Activision Blizzard (ATVI – Free Report)	, Ubisoft Entertainment (UBSFY – Free Report)	, and others fell as well last week. 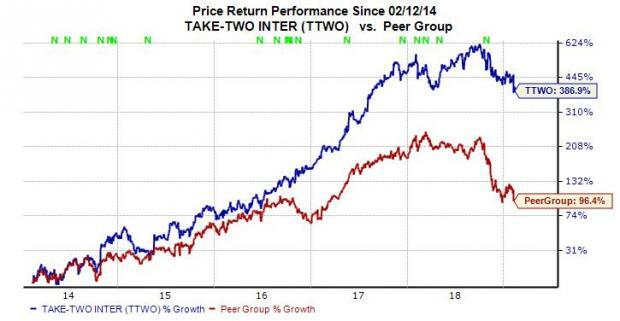 With that said, Take-Two stock has outperformed its peer group, which includes Nintendo (NTDOY – Free Report)	, Mattel (MAT – Free Report)	, and some of the firms we have already mentioned, during the last five years. Overall, TTWO shares rest roughly 33% below their 52-week high of $139.91 a share. Take-Two will have to address concerns about Fortnite, which is owned by privately-held Epic Games. But we should remember that nothing last forever, and the Fortnite fad, which has exploded over the last year, could fizzle out just as quickly as it started. “We continue to have stellar results despite the fact that there are competitive titles in the market, including Fortnite,” CEO Strauss Zelnick said on Take-Two’s earnings call. Take-Two also raised its full-year adjusted revenue forecast to between $2.89 billion and $2.94 billion, which did come in below Wall Street estimates of $2.98 billion. Looking ahead to the company’s fiscal fourth quarter, revenues are projected to surge 29.2% from the year-ago period to reach $531.36 million, based on our current Zacks Consensus Estimate. Plus, TTWO’s Q1 fiscal 2020 revenues are expected to soar over 80%. At the bottom end of the income statement, Take-Two’s adjusted quarterly earnings are projected to soar 52.2% to reach $1.05 a share. Meanwhile, the firm’s first-quarter 2020 EPS figure is expected to skyrocket over 268%. Investors should note that the company’s earnings picture has turned more negative for the current quarter and Q1 recently. But the company’s full-year 2019 and 2020 earnings picture has turned more positive over the last 30 days, which is a solid sign amid its industry’s Fortnite worries. Take-Two is currently a Zacks Rank #1 (Strong Buy) based in part on its longer-term earnings revision picture. The company also sports “A” grades for both Growth and Momentum in our Style Scores system. Let’s also not forget that TTWO stock rests well below its 52-week high and is trading at 23.8X forward 12-month Zacks Earnings Estimates. This marks a discount to Take-Two’s one-year high of 43.9X and its 52-week median of 30.1X and means the stock presents solid value at the moment.